A growing number of Liberal MPs say they're prepared to boot Jody Wilson-Raybould and Jane Philpott from caucus next week, according to a survey of dozens of Liberal MPs by CBC News. CBC News has learned that MPs will discuss expelling the two women when they return to Parliament from their ridings next week. Some MPs who don't want to be identified say that if the matter of the two MPs' caucus status isn't on Wednesday's caucus agenda, they'll stand up at the meeting and ask their colleagues to vote on ejecting Wilson-Raybould and Philpott. Liberal MPs from all regions of the country tell CBC News they feel the two former cabinet ministers can't stay. "I've come to the conclusion that they both have lost any right to be a part of this team," Quebec MP Alexandra Mendès wrote in an email. She said serving in a party caucus requires "loyalty and team spirit." 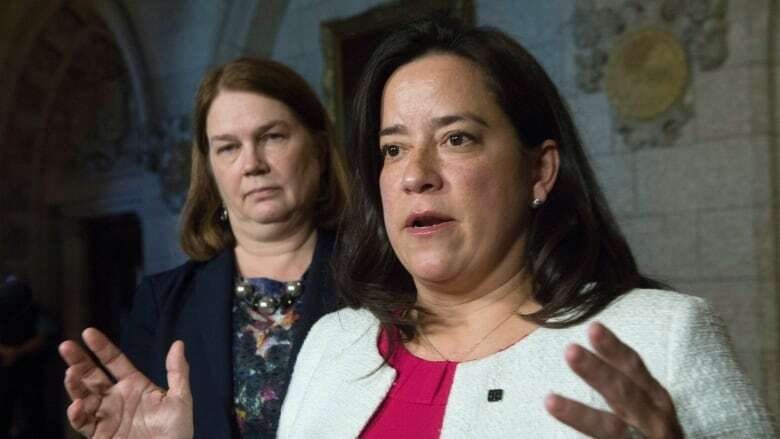 Many caucus members who once said they thought Wilson-Raybould and Philpott could remain now say they don't understand how they can continue to identify as members of the Liberal Party given the damage done to the government by the SNC-Lavalin affair. At an event in Halifax yesterday, Prime Minister Justin Trudeau was asked if he thinks the two MPs should be permitted to stay. "As for what Dr. Philpott and Ms. Wilson-Raybould intend to do as next steps, people are going to have to ask them," he replied. CBC sent emails to Wilson-Raybould and Philpott; so far, neither has responded. The Montreal-based global engineering and construction company had been seeking an agreement that would allow it to avoid criminal proceedings and a possible 10-year ban on bidding for federal contracts in the event of a conviction. Philpott resigned from cabinet on March 4, saying she had lost "confidence" in the government's handling of the SNC-Lavalin file. Other senior Liberals have suggested that while the caucus is inclined to expel them, they feel the better option would be for Wilson-Raybould and Philpott to leave of their own accord, as did Whitby, Ont. MP Celina Caesar-Chavannes. She quit the Liberal caucus March 20 to sit as an independent. Some Liberal MPs aren't ready to say one way or the other. "Both of them have been great colleagues and, you know, we'll see how that evolves. But again, decision's not going to be mine. I'll be, of course, part of the caucus, but we'll just wait and see how things evolve from here," said New Brunswick MP Pat Finnigan. "I mean, any member who wants to stay part of the caucus has to say that they support the prime minister and, obviously, they support the Liberal agenda. We all got elected under the Liberal Party of Canada. I mean, I'll leave that question up to Ms. Wilson-Raybould and Ms. Philpott, whether or not they want to remain part of the caucus," said Ontario MP Francis Drouin. Some caucus members say they still think the two MPs should be permitted to remain. "I strongly believe that our caucus is made stronger by the continued presence of Ms. Wilson-Raybould and Dr. Philpott within it, and that it would be a mistake to expel them from caucus," New Brunswick MP Wayne Long said in an email. "I'm proud to be a member of a caucus in which members who share the same set of progressive values are free to express their views, and those of their constituents, on the issues that matter to them, even when they disagree with our leader or the majority of caucus members on those issues." A decision on expulsion could come as early as next Wednesday. Hannah Thibedeau is a veteran political reporter having covered the Hill for more than 15 years, both behind the scenes and in front of the camera. She covers politics for CBC TV, CBC Radio and CBC Politics online.